For nearly thirty years, Lisa Roet has investigated the relationship between humans and primates through a variety of artistic mediums. 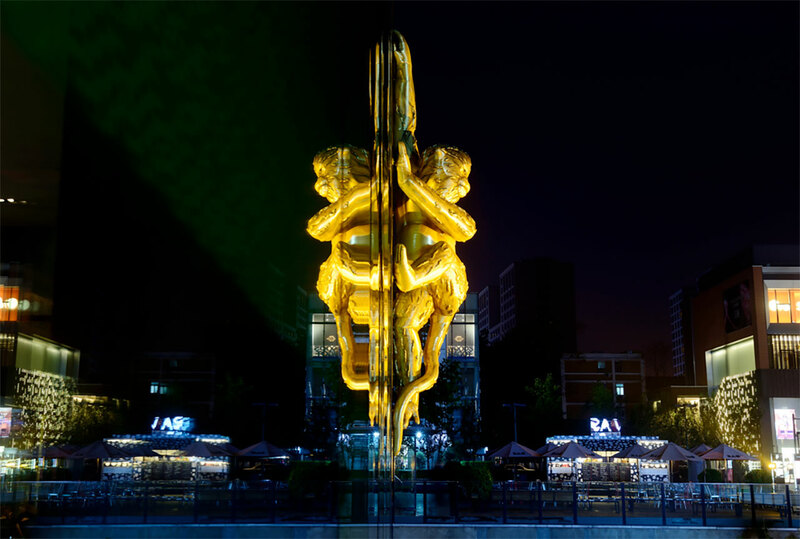 Her latest work, Golden Monkey, is a fourteen-metre high inflatable golden sculpture of the sneezing snub-nosed monkey, clinging to the side of a hotel thirty metres above the ground in Beijing’s central Chaoyang district. The work was commissioned as part of Beijing Design Week, and is part of a project Roet has been working on for a number of years, examining the way new species of monkey have been discovered due to habitat destruction. She says that for the exhibition she wanted to represent the image of a “fragile, slightly frightened monkey clinging to the side of a large urban building in some of the most densely human-populated environments in the world”. The ephemeral and fragile nature of the inflatable monkey contrasts with the structure it is holding on to. At the beginning of Roet’s career, she says “it was very unfashionable to talk about nature and the environment in contemporary art”. As a teenager, she wanted to pursue a career in zoology, but found that the arts came more naturally to her than science, and so she decided to study primates as a visual artist instead. She remembers that when she started, “funding bodies would ask me if I was an artist or a scientist, and couldn’t fathom how I could mix both.” Despite this, the focus of her work has remained the same, although she has investigated it using a variety of forms including animation, sculpture, film, and photography. The snub-nosed monkey was discovered in Myanmar in 2010. One year later, scientists in Southern China heard stories from locals of a sneezing ancestor high in the mountains, and after investigation identified this as a subspecies of the critically endangered monkey. Roet heard this story from a scientist friend, and then began her own research, visiting the monkey’s relatives in the Beijing zoo and seeking out experts. 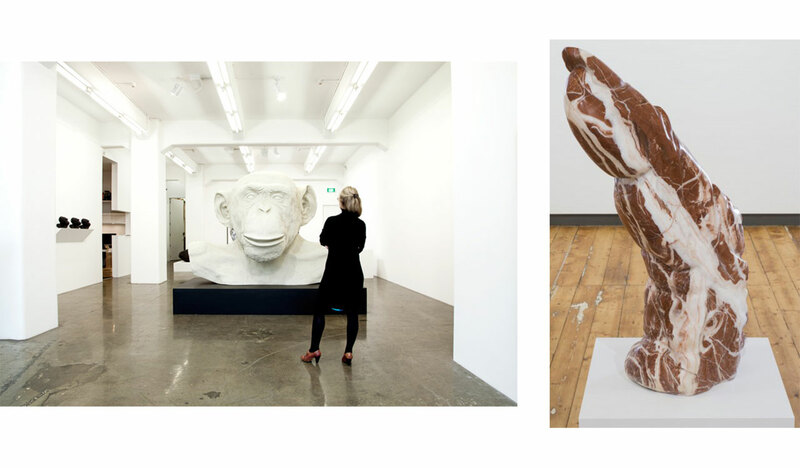 She then created a model and began the process of physically creating the sculpture, which she says is “the perfect metaphor for the introduction of this monkey in an urban environment, and likewise its de-inflation represents how easily it can disappear”. Since the sculpture’s installation, 100,000 people have passed through the precinct every day. Golden Monkey has been invited to travel to Hong Kong and Miami. Roet says the response has been “incredible”. Roet links these reactions to what she describes as “antiquated views of hierarchy projected through religious beliefs”, and the way that “self-interested human individuals have allowed people to feel entitled to land, nature, and our environment”. Her exploration of these attitudes through artwork starts with research and documentation. She says, “I either use scientific research or an actual cast body part, skin texture, or hand print as the starting point”. In this way, there are parallels between her approach and that of documentarian Werner Herzog, whose work has had a profound influence on her artmaking practice. By creating works which operate on the boundaries of art and science, she brings these similarities to light, and encourages us to confront the way we relate to them.